In today’s era of ‘Bring your own device’ (BYOD) mobility and ‘Internet of Things’ (IoT) devices proliferating networks as unknown or unmanaged connections, the cyberattack surface for most any organization continues to grow at an alarming rate. No longer can organizations rely on guarding their perimeter and trusting they know everyone and everything that is accessing their network. Proactive threat prevention in today’s BYOD and IoT era requires continuous network access visibility and intelligence as well as being able to automatically apply context-aware security policies such as segmenting devices and users without having to re-build networks or knowing the devices upfront. - Network security trends and challenges, including the more destructive ransomware, cryptoransomware, wipers, etc. 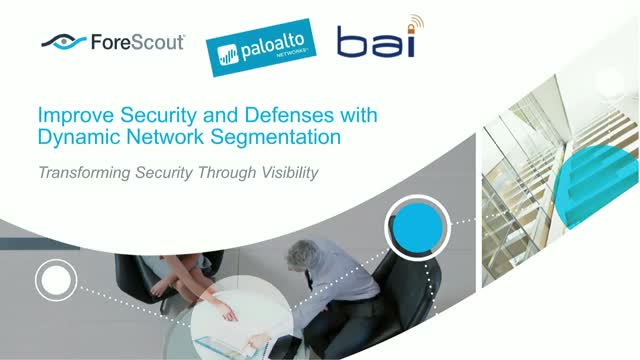 BAI will share some of its key learnings based on extensive experience implementing successful solutions that target attacks while creating more highly available, responsive, and automated networks. BAI is a team of Security Architects who have provided Automated Detection, Prevention, and Orchestration to protect Government Agencies, Higher Education and Fortune 1000 commercial accounts.